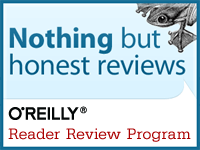 I got to review the O'Reilly book about AngularJS, which was nice since I was planning on using it for a recent project. I followed through most of the examples, which went OK-ish. Yes, I'm very impressed with how easy it seems to be to make very dynamic and interactive web apps. But as soon as I tried to apply it to my own project, I had quite some problems getting it working. Especially with concepts like directives or getting functions from multiple modules work together, I couldn't get the required knowledge from the book to get them working.